This Community Drum Circles page is where you can find all the community drumming events that I do for you to enjoy in the Hampton Road/Tidewater area of Virginia. Just click on the links to be taken to the site that has more specific info about each event. If you would like to have a Professionally Facilitated Community Drum Circle for your special event you can by filling out the CONTACT page and send your request. This is the main Web Site for the Virginia World Rhythms Drum Circles. This is the Web Site for Lovers of Drum Circles. Here you will find the right place to share your rhythms with like-minded folks of all ages and levels of playing, from beginners to advanced alike. We have indoor and outdoor Drum Circles from Richmond VA to Virginia Beach. This Summer/Spring/Fall we have Full Moon Drum Circles on the sands of Virginia Beach. We have Drum Circles every second Sunday of the month at the Sam Ash Music Store in Richmond VA. We will include as many Drum Circles as we find them too like the Mystic Moon Drum Circle in Norfolk VA. There are Special one day events and multi-day Drum Circles to fulfill all of your drumming desires. This is where you will come to experience the incredible power of rhythms that transform your inner being. Richmond Rhythms Drum Circle Find Drum Circles in Richmond VA.
Join the young (and young at heart) who discover the world during the International Children’s Festival. The rich array of sights, sounds, and tastes of distant lands that will captivate the senses of children and adults alike. Experience the beauty and wonder of exotic places as over thirty countries and cultures showcase their unique heritages. The festival commences with the Parade of Nations at 10AM. Time Details: 10AM – 5:00PM. Parade of Nations starts promptly at 10:00am. Cost: Admission is free to the public. Come join us and welcome the Full Moon where you get to set your intentions and Share your Rhythm Spirit with everyone. These family friendly events feature drumming, dance, chanting, singing, local artists, healing, and much more. The energy of the circles shifts with the lunar cycles and is different each time. All traditions and faiths come together to honor the gifts of our shared community, planet, and universe in music, rhythm, and fellowship. Some drums and percussion instruments will be provided on a first come basis. Bring any drums, or other rhythm making instruments that make a wonderful sound for you and others to share with. Where the energy of life flows from person to person and fills the void you may have in your heart. And if your heart is already full then come for the wonderful experience of being in a Community Drum Circle with your family and friends where you get to give your excess energy to those who need it the most. And if you don;t have family and friends make some while you are there. This is the Solar Eclipse New Moon Drum Circle led by Arthur Lopez from DrumYourDream.com. at the Edgar Cayce A.R.E Labyrinth in VA Beach. There were close to 200 attending this event as they played drums and watched the Solar Eclipse. The New Moon Spiritual Naturalist Drumming Group is where you will enter that trance like state of pure experience; without labels; without judgments, and the fictions they often impose upon us. This is, of course, a meditative state. It is also an example of flow which is being more appreciated lately as a source of contentment and happiness in life. And, it is in this altered state of consciousness, that we can become perceptive to things we often overlook. Rhythm Healing in Every Beat Made. Drums and percussion instruments will be provided on a first come basis or bring your own special soundmaker. Bring your singing voice, a chant, a chair, blanket and especially your Special Good Energy Rhythm Spirit. Second Sunday of the Month Sam Ash Music Store Drum Circle in Richmond VA. From 2 PM to 3:30 PM. Hello Drummers, The Sam Ash Music Store in Richmond has provided a wonderful place to gather all Hand Drummers from near and far to share our Rhythm Spirit all year round. You Don’t have to worry about it being too cold during the Winter months or too hot during the Summer. And if it rains, all the more reason you should come because whatever you were going to do outside is probably canceled now. They let us use their instruments in the store for you to enjoy. In the spirit of building community we all share a little about ourselves with the group before we begin. This way everybody gets to know one another and help foster better camaraderie among the group. So now there are no excuses for not coming or bringing a friend who is curious about playing hand drums. 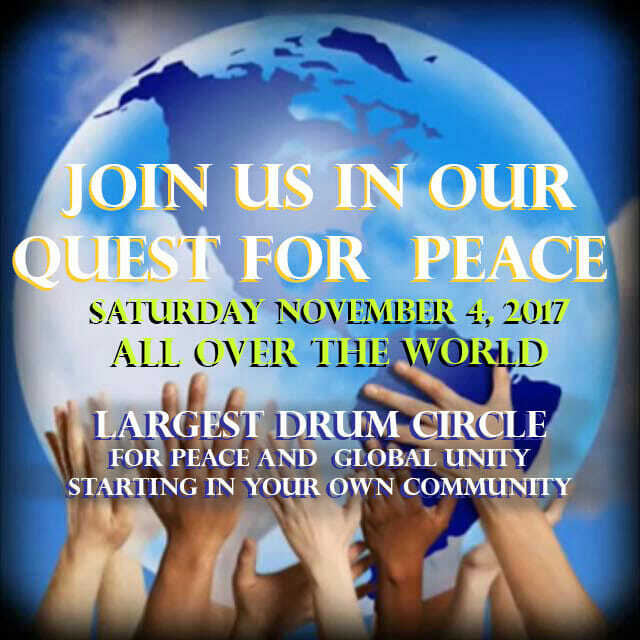 DrumYourDream provides Professionally Facilitated Drum Circles for community based events, schools, assisted living homes,ice breakers,corporations, nonprofit organizations, parties, weddings and for community building. with your request and for more information. HAND DRUMMING LESSONS FOR YOU! Arthur is now offering Private Hand Drumming Lessons. Hand Drum Instructor: I specialize in Private Hand Drumming Lessons for you. My goal is to teach has many students as possible the art of Hand Drumming for relaxation, fun, musicality and spiritual awakening. Each person has rhythm inside of them. I help you find your inner rhythms to play with everyone. My specialty is helping you build confidence to play for yourself and with everyone in a Drum Circle. Lessons at my studio Just $30 for a half hour $45 for 1 hour. Or at your home or other place that is nice to drum at, like the park, for $65.an hour. Wedding Drum Circles Celebrate your Wedding with a Drum Circle with your Friends and Family. The Community Drum Circle is the use of a rhythm-based event as a tool for unity. It is NOT a drum class. It’s NOT using culturally-specific rhythms. A community drum circle in the United States is a fun, family friendly event, where people empower each other in the act of celebrating community and life through rhythm and music. People of all levels of musical expertise come together and share their rhythmical spirit with what ever drums and percussion they bring to the event. They don’t have to be a drummer to participate. Everyone has something to offer the circle, and any one is welcome. The spirit and magic of rhythm expressed on drums and percussion instruments cuts through all ages, sexes, religions, races and cultures. “Rhythm”, as Gabriel Roth says, “is the mother tongue.” Rhythm is a universal language known to every one, even the youngest child, if we can just “remember.” So in a very objective, yet beautiful way, an interactive rhythm event puts us all on an equal footing with each other and brings us closer together. The facilitator serves this process by guiding the participants to their highest musical potential. A community drum circle is created, “in the moment” by all the people who participate. Co-operation and collaboration is the basic glue. When we drum together, sharing our spirit in the form of rhythm, it changes our relationships. As we play together, we give ourselves a rhythmical massage and an emotional release. The experience is unique to each person in the circle, and it happens whether we are entraining ourselves into the circle by drumming, or standing outside the circle and listening while tapping our feet and clapping along with the music. To make beautiful music together, all we have to do is bring to the circle whatever rhythmical expertise we have to offer, along with the excitement of sharing it with other people. The quality of the music produced in an event like this is not based on the rhythmical expertise of the players, but on the quality of their relationship with the other people in the circle. The result is those magical musical moments where one powerful voice is created out of the many. In those moments, the players stop worrying about keeping time because time, as they know it, has stopped. In it’s place is a living breathing entity, expressing timeless joy, passion and release through the power of rhythm. That is the beauty of a community drum circle.